Zapier is a platform that enables you to automate tasks between individual online services. At the moment we are testing our Zapier app and only users that have explicitly been invited can use it. Please use the button below to join the private beta! We would be glad to receive your feedback! There are two basic principles to Zapier: triggers and actions. 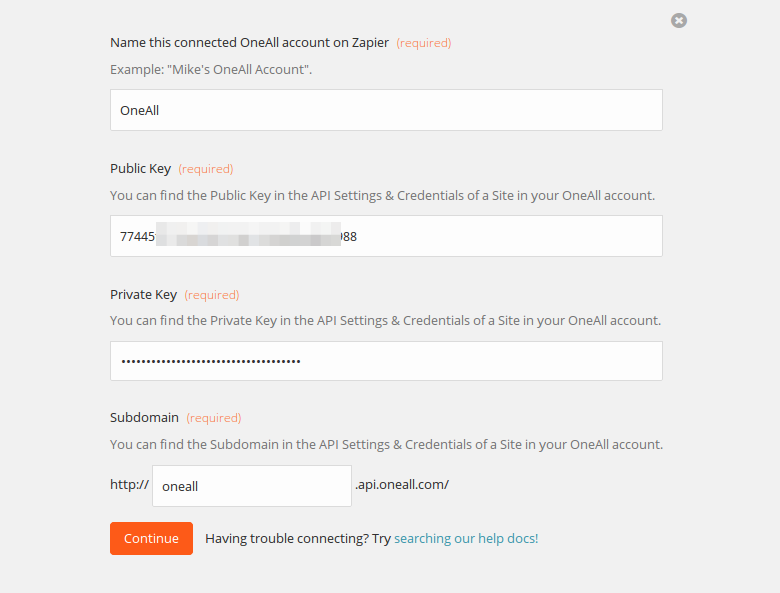 When using OneAll with Zapier, your triggers are users connecting with OneAll Social Login. The trigger is called whenever a user connects with his social network account on your website or mobile application. The action you want Zapier to perform is up to you. You could for example add the contact information from the social network profile to a CRM. You could also add it to an email marketing tool like MailChimp. The possibilities are growing by the day as new services are added. This guide describes how to create an example Zap, which adds new Social Login users to a MailChimp subscriber list. By using the same approach you can connect OneAll to any other app in the Zapier ecosystem. Under Choose a Trigger app... select OneAll and then Social Login. Under Choose an Action app... select MailChimp and then Add Subscriber. Now connect your OneAll site and copy/paste the data from the API Settings & Credentials panel of the site. You should see a message Account is working after having added the credentials. Now connect your MailChimp account and make sure that it is working properly. In this guide we are using MailChimp as an example. You can of course also connect any other app from the Zapier ecosystem. We only want to subscribe users to our MailChimp list during their first login to our website. To skip subsequent logins we add a custom filter where the User type does not contain the value new_user. Some social networks (e.g. Twitter) do not provide the email addresses of their users. To prevent these users from being added to MailChimp we add the condition that the Email address must exist. This is where the magic happens. First select the MailChimp list to add the users to and then the select fields ("Insert Fields") to be used from Social Login. You have to fill in at least the Email address, and you should also fill in the First Name and the Last Name. Click on the Test OneAll Trigger button. Now you must use Social Login of the OneAll site that you have added at the beginning. First login with your social network account and then wait at least 60 seconds. After 60 seconds return to Zapier and click on Ok, I did this. If you've done everything correctly you should see the message We found your changes! Now click on the All done! button, give your Zap! a name and do not forget to turn it on.